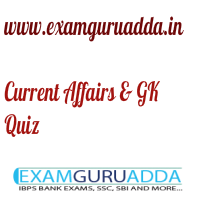 Dear Readers Examguruadda.in presents Current Affairs quiz of 9-10th January 2017 that cover important current affair events. Current Affairs quiz for IBPS PO,clerk, RRB-Po,Clerk, SBI, NIACL,Railways and SSC Exams. 1. Who has won the 2016 Best FIFA Men’s player award? 2. India’s largest public WiFi service has been launched by which state government? 3. India’s first international stock exchange “India International Exchange” has been launched in which city? 4. Which Indian personality has been honoured by US Embassy for Tuberculosis (TB) awareness? 5. Mario Soares, who passed away recently, was the former President of which country? 6. The book “Magpie Murders” has been authored by whom? 7. Zygmunt Bauman, who passed away recently, was the renowned sociologist of which country? 8. Which country test-fired the first submarine-launched Cruise Missile Babur-3? 9. . Who was appointed as the Chief Executive Officer of Flipkart? 10. Which Indian teenager has won the Young Travel Photographer Of The Year (TPOTY) award 2016?